Labour and skills shortages are the most pressing challenges facing manufacturers today. CME is working to expand the labour pool; improve education programs; and lower the cost of on-the-job training. Access to an abundant, high-quality workforce is critical to manufacturing success. It boosts output, productivity and profitability. It also drives innovation and is vital to taking the fullest advantage of new technologies and production methods. Not having workers with the right skills prevents them from using new technology and equipment to their fullest potential. These and other issues are preventing manufacturers from maximizing their potential and operating as effectively as possible. 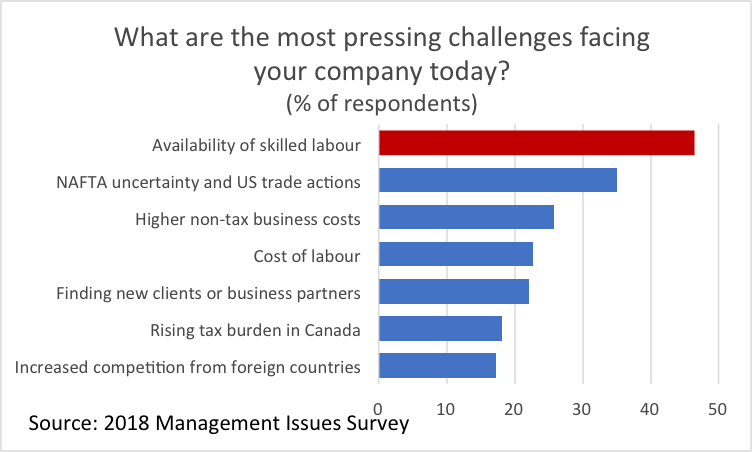 According to CME’s 2018 Management Issues Survey (MIS), skilled labour shortages is the most important issue facing manufacturers today. Companies are playing a growing role in workforce training because too few students are graduating from relevant programs; and because of the increasingly-specialized skills requirements for advanced technologies and production processes. Increasing government support for WIL, especially for those businesses that can leverage their training assets to help other businesses in their supply chains. Women account for only 28% of the manufacturing workforce. Female under-representation is especially a problem in production-related occupations, with women holding less than 5% of all skilled trades jobs across Canada. Attracting more women into manufacturing professions is critical to helping companies grow and replace the aging workforce. 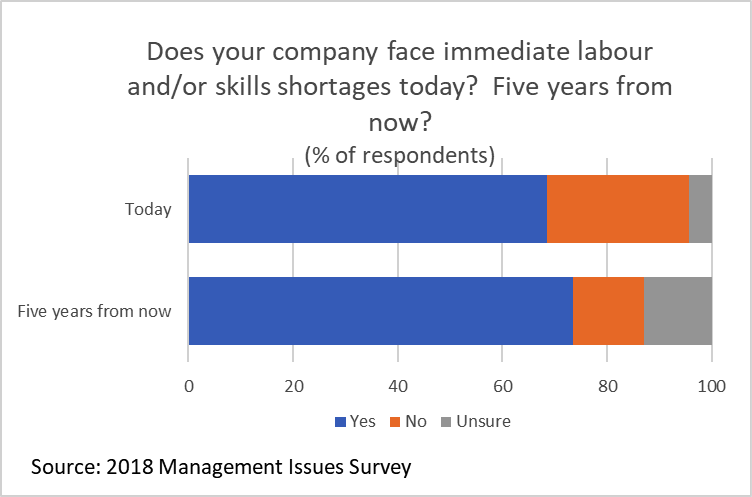 69% of respondents face immediate shortages; 75% expect shortages within the next five years. Access to skilled labour is the most important factor businesses consider when deciding where to make their next major investment. Women represent a vast and relatively untapped resource that offers a solution to these problems. Engage and Inspire – Develop the pipeline of qualified women by promoting STEM and skilled trades career options to young women and girls. Attract and Retain – Increase the number of women entering and staying in the manufacturing workforce. Empower, Support and Accelerate – Help women achieve success in the workplace by breaking down barriers to their personal and professional growth. Improve linkages between businesses and post-secondary institutions. To get involved with CME or to provide comments on our position, please contact CME Senior Vice President Mathew Wilson at Mathew.Wilson@cme-mec.ca.